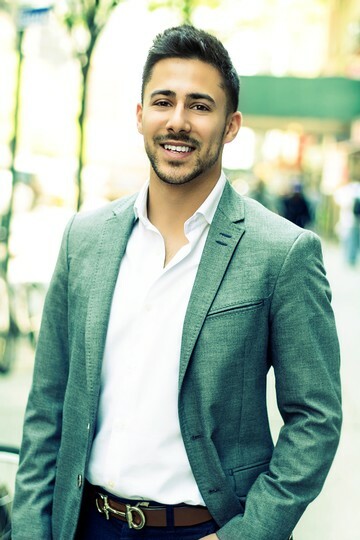 Jonny was born and raised in Queens, NY and graduated from Baruch College with a Bachelor’s Degree in Real Estate Development. Although his current passion is real estate, he effortlessly maintains a number of other entrepreneurial endeavors, including running an e-commerce jewelry business (that he built on his own at the age of 18) as well as being a dance motivator on the weekends in NJ & NYC. Brought up in the fast-moving sales industry of the Diamond District where his father still works today, he’s learned his entire life how to cater to his clients and lead them through any rental or sale transaction with empathy, energy, and expertise. If you’re looking for a friendly and transparent experience, he’s your guy! 2 BR at BROOME ST.
February 2019 by Joshua L.
Jonny was extremely helpful during my apartment search. He responded immediately to my inquiries and even made time to see the apartments that afternoon! Even though I had more places to see, he kept me informed about the listing throughout the week without ever being pushy or urging me to act quickly/make a decision. I''d recommend his help to anybody in the market for a new place. February 2019 by Nimisha S.
Jonny Borochov was THE BEST I could have asked for! Being a new comer to NYC, Jonny put me at ease with his wealth of knowledge as well as his unstoppable dedication to finding me the perfect apartment! Not only was Jonny great at his job, he was also such a pleasure to spend countless hours apartment hunting with (you should hear my mom rave about him)! His commitment to finding the perfect apartment shined through when he helped me get in contact with other brokers that had access to apartments he thought I’d like—meaning that he would not get commission from my rental. I would 11/10 recommend Jonny to anyone and everyone for his honesty, commitment to my search and stellar personality! February 2019 by Gigi Z. The experience with REAL New York has been amazing! I would 100% recommend Jonny if you’re currently looking. He was very attentive and helpful. He made the process extremely easy going. Even though I was living in Puerto Rico when we were looking for apartments he made sure I had every possible bit of information I needed and helped me throughout the whole process. Even after we moved in, he was available to us for anything we needed. He was very professional and clearly knows what he is doing! February 2019 by Nick C.
Me and my roommate worked with Jonny Borochov and he was fantastic. He found some great apartments right away and got us in conveniently. He had insight for each building and management company. There was a unit that didn''t look great from the pictures but he assured us it would be a good fit and took us to see it. The unit was perfect for us!! Through the lease process he was responsive, followed up, and got everything that needed to be done right away. It was a pleasure working with him and I would recommend him to anyway looking for an apartment in the crazy NYC market!